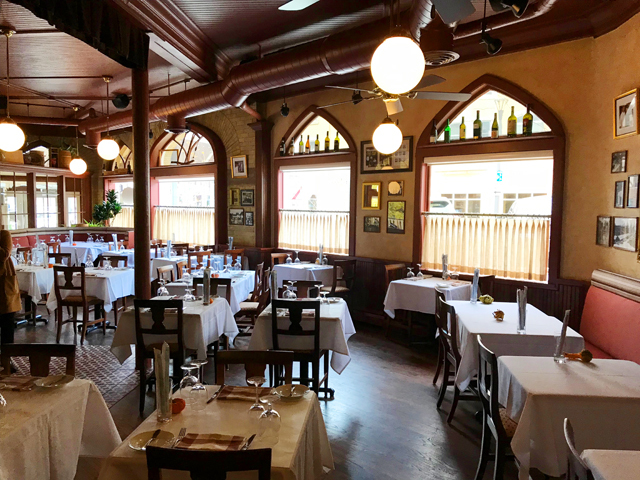 Ristorante Bartolotta is 25 this year, but its building dates to 1899 and occupies a site that housed a tavern for decades before that. Published Dec. 4, 2018 at 9:02 a.m. 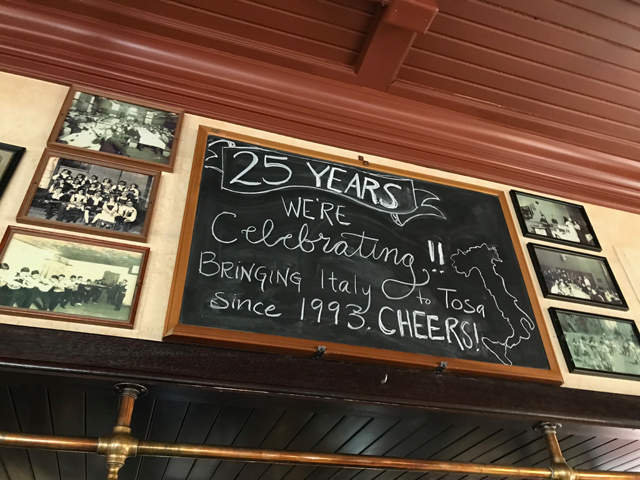 This year Ristorante Bartolotta, 7616 W. State St. in the heart of Wauwatosa Village, celebrates its 25th anniversary. That's definitely a landmark distinction considering the Italian restaurant's role not only in helping to kickstart the dining scene in the Village – where it remains an anchor draw – but in launching the Bartolotta Restaurant Group and playing a key role in boosting the entire Milwaukee-area dining scene to the next level. "It started the whole thing (for us)," says owner Joe Bartolotta, as we sit with empty espresso cups before us at a banquette in the restaurant – portraits of Bartolotta's grandparents gazing down at us from among the vintage images that adorn the walls. After reminiscing about childhood visits to the pancake house that occupied the space when he was a kid, Bartolotta adds, "There wasn't much here. It was us and (The Chancery's) Joe (DeRosa) at the time. We had thought about moving the business at one time – (because of) the economics; it's just so small – but vacating this building would be too painful for us." 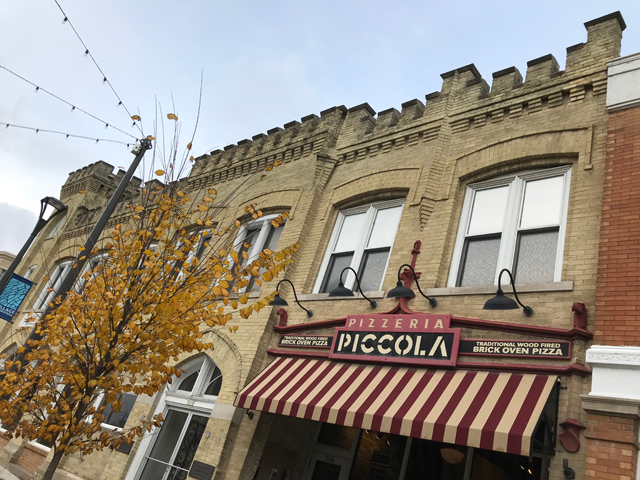 Instead of moving, Bartolotta doubled down – or tripled down, if opening Pizzeria Piccola next door was doubling – and spent more than a half-million dollars to renovate the Ristorante. "We called it a refresh and it's a fine line because people are in love with this space and I didn't want to move their cheese, so to speak," says Bartolotta. "I didn't want to create a shock to the system. "But it had gotten tired after 25 years of being pounded, and the bathrooms were really not great. There was an uneven floor (near the bar) that we had to fix. We put in some really beautiful Italian tile. "So what you see here now is very similar to what we opened with. It is largely invisible (to customers), but new light fixtures, new HVAC, new computer systems, new coffee machine, new bathrooms." Bartolotta's brother and partner, Paul, came in to tackle the kitchen. "That's where most of the money went," says Bartolotta. "I turned Paul loose on the kitchen and (Chef) Juan (Urbieta) was very involved. We built a showcase kitchen and it makes a statement. We're bringing people through here and we want to show them that we're truly serious about investing. "On paper, this would not be something you would put 600 grand into. Because the recovery time on that is long, but it just made sense to do it. This is our first restaurant. We're celebrating our 25th anniversary. It's a big deal." It is a big deal; 25 years is a long time. But in the history of the building and especially of the site, 25 years could seem almost like a blip. In 1835, Charles Hart built a couple mills along the Menomonee River that grew into the town of Hart's Mills. 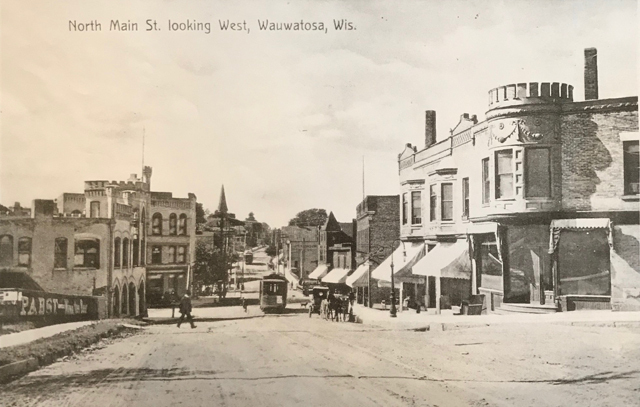 Just five years later, the town of Wauwatosa was created, as homes and businesses sprung up nearby. In 1842, Tosa got a government together and just nine years later, the railroad came through, cementing the future of this little village. 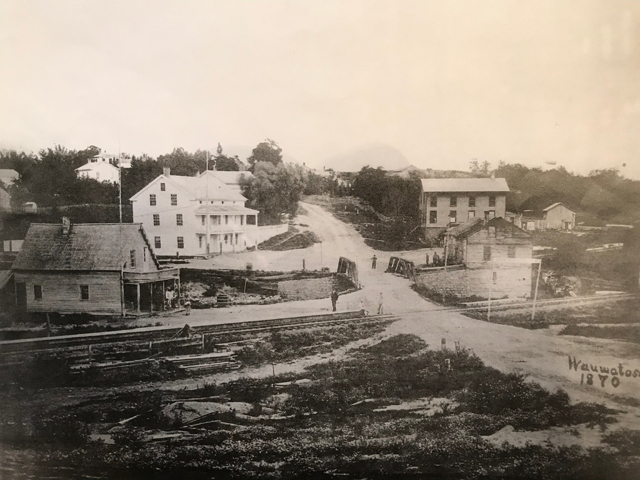 On the corner of Harwood (then Main) and State stood the Dearsley Tavern, a prominent landmark in old photographs of Wauwatosa, including the one below, taken in 1870, where you can see it just across the street and to the right of the bridge. 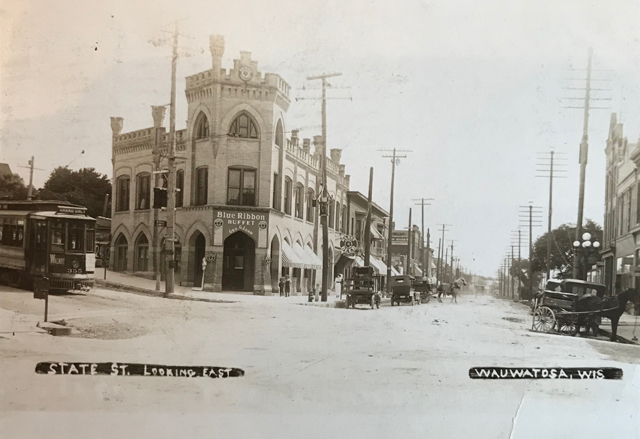 "The business portion of Wauwatosa is in ashes; early this morning, 13 buildings burned, among them are the principal business blocks. Post office damaged. Hotel Irvington and St. Paul Railway depot saved. Loss estimated at from $45,000-$50,000. All that portion of the village at the corner of East Main and State Streets is a mass of smouldering ruins and had it not been for the prompt action of a portion of the Milwaukee Fire Department in going to the rescue, there is no telling where the flames would have stopped their work of destruction. A small hand pump, with a limited supply of hose, and operated by volunteer firemen, constitutes the Wauwatosa Fire Department. There is no water works, the county board having only yesterday voted down the plan to extend the city mains to the village, and the water used has to be pumped from the Menomonee River. Fire started between Richter's Bakery and Thomas' Barber Shop, discovered about 5:30 by night watchman Abbott." What's interesting to note from such reports is the number of taverns out in Tosa at the time. In addition to Dearsley's, George Richter had a saloon and so did the Schilly Brothers. So did one Charles Jacobus. 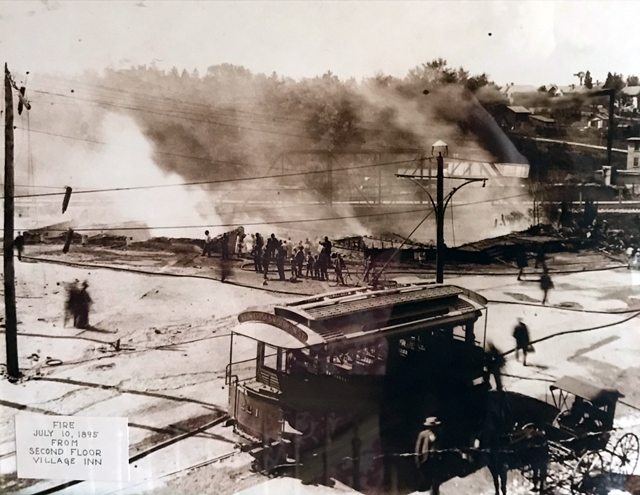 After the fire, a small brick building appears to have risen on the Dearsley site, and a photo taken in 1898, shows it to be the tavern of William Worm, a purveyor of Cream City Brewing Co. suds, and apparently also a carpenter and contractor. But Worm's place was short-lived there, because it is believed this photo was taken for the Pabst Brewing Co., which was eying the site for a tied house. And in 1899, that's exactly what went up. 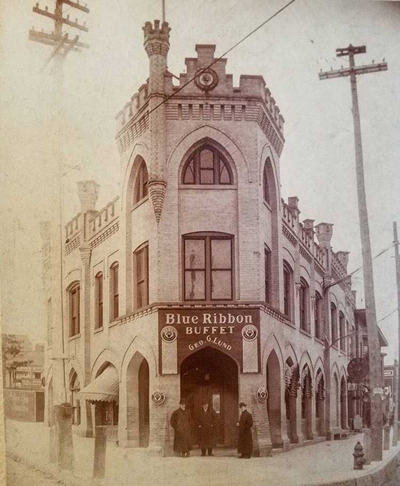 The striking, almost medieval, crenellated castle-like Victorian Gothic structure that you see today – the architect of which may have been Otto Strack, Charles Hoffmann or Charles Linde, all of whom did similar work for Pabst during this era – opened as a new home for saloonkeeper Charles Jacobus' beer hall. 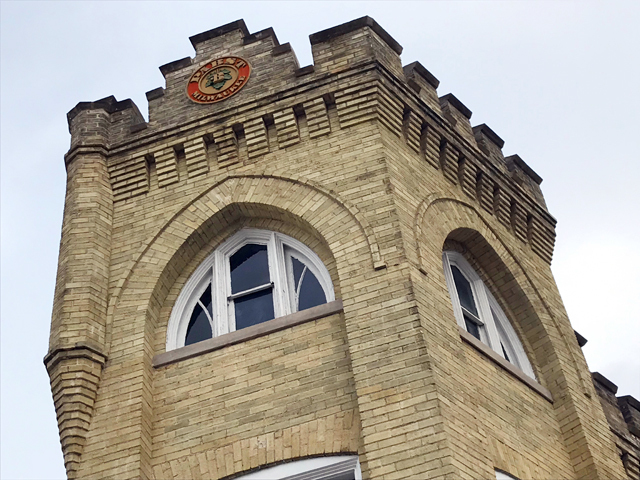 The battlemented gem was built by mason Fred Yehle, who had worked on the nearby Dittmar Building (long home to Robertson's Hardware) two years earlier, and boasted an impressive tower and stunning rows of Tudor arched windows along the sidewalks. Initially, at the main entrance there was a portico and the first arched window on either side of the door was an open doorway into this covered, but open, entry area. As an interesting aside, Yehle and Worm were both elected Wauwatosa trustees in 1892. 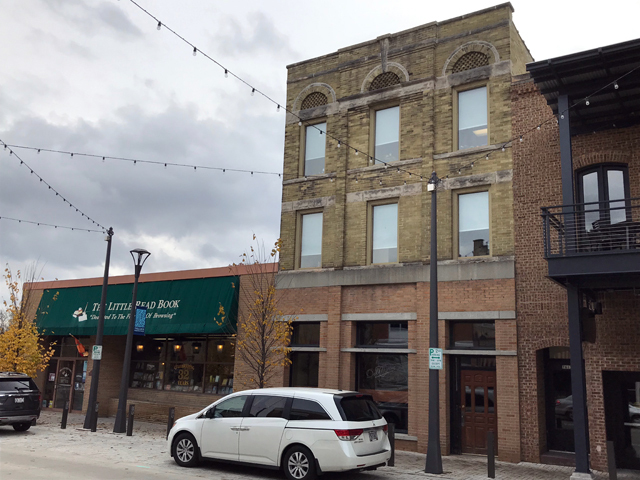 In 1902, an addition, in a similar style, was put up for Jacobus along State Street, and business must have continued to be robust because by 1910, Miller built a tied house directly across the street in the Luetzow Building, 7613-15 W. State St., pictured below. 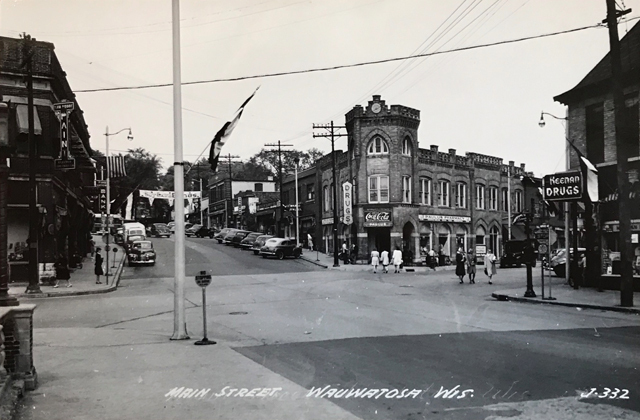 That addition later morphed into a separate retail space that – along with the upstairs living quarters later converted to offices – had many tenants over the years, including the Wisconsin College of Music (1926-39), Brouwer's Shoe Store (1929-57), an auction company, Wallace Jewelry in the 1970s, Jitterz Coffee House (1997-2002) and, since 2003, Bartolotta's Pizzeria Piccola. 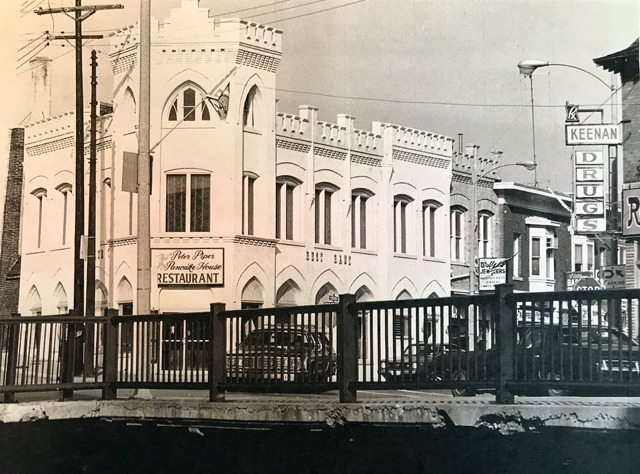 By about 1905, George G. Lund took over the place, running the Blue Ribbon Buffet beneath the crenellations and Jacobus is listed in later directories as a vendor of feed and coal, as well as a concrete contractor. In 1907, the building was remodeled, according to the Wisconsin Historical Society's Architectural Inventory. 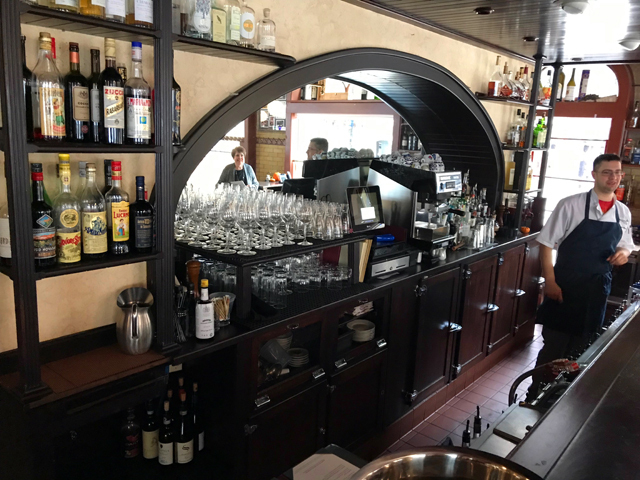 It's unclear how long Lund remained behind the bar, but Prohibition arrived in 1919 and surely changed the complexion of the building, which beginning in 1926 became a pharmacy. 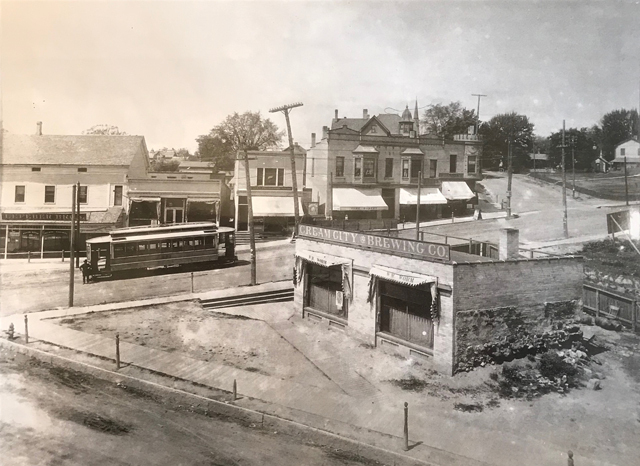 Klumb's Pharmacy, which was originally located at 31st and National, moved in and stayed until 1941, when it Eugene Paulus took over the space and opened his own eponymous drug store, run at least for a time by his son Robert. At some point, parts of some of those beautiful arched windows had been bricked up. Klumb's had painted a sign on at least one of them. By then the portico had been enclosed, too. Paulus Drugs lasted until two months before its namesake's death in August 1966. It was replaced by Peter Piper Pancake House, fondly remembered by Joe Bartolotta. "It had all white booths along the walls with blue vinyl cushions on it," he recalls. "The carpeting was blue and, literally, would would make a tch tch tch sound. There was so much syrup spilled on the carpeting that you would literally stick to it when you walked. "We were born and raised on 71st and Milwaukee Avenue and our church was St. Bernard's right at the top of the hill here. We had a great block and it was just loaded with kids. We had what we thought was an infallible scheme. Me and my brother and some kids in the neighborhood were like a pack and our parents always would make us go to church on Sunday. "We would go to church, walk in the entryway, grab a church bulletin and then walk down the hill to here and we'd come in. We'd scratch together enough to buy some pancakes and then we'd go back home, making sure that the church bulletin was in our back pocket or we threw it on the table. We did it for quite a while, but eventually we all got busted." 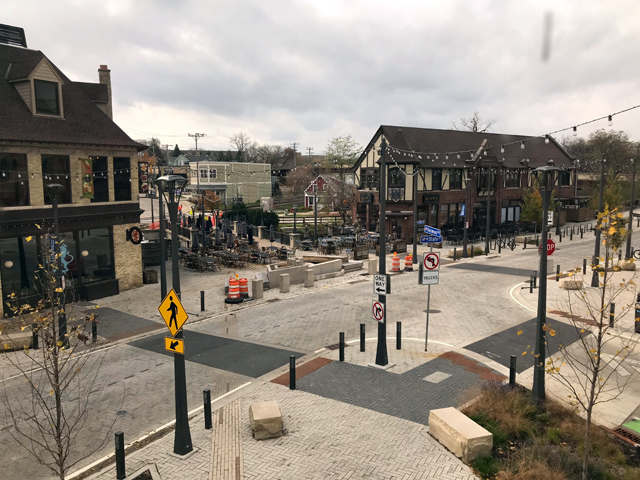 Piper's lasted into the 1980s and in February 1987 Jim Pural – who had worked at the Coffee Trader on Downer Avenue – and Ron Maier opened Harwood's in the space, wisely ripping out the carpeting and adding the bar that you see today at Ristorante Bartolotta. 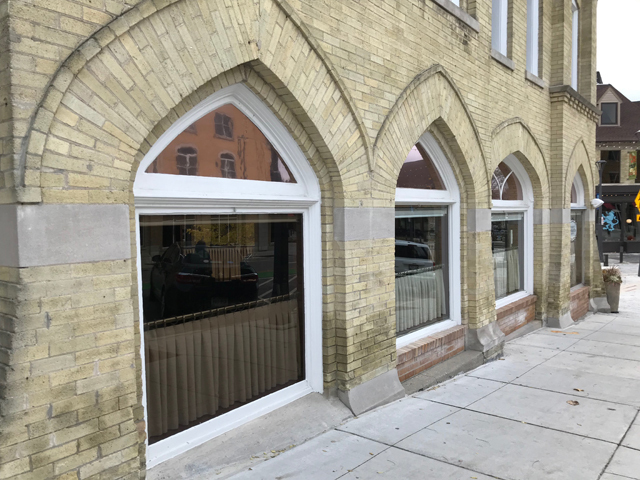 The new owners also re-opened the bricked up windows, removed a drop ceiling to restore the original heights and expose the crown molding, poured a concrete floor in the old dirt-floor basement, and updated the wiring and plumbing during a month-long renovation. 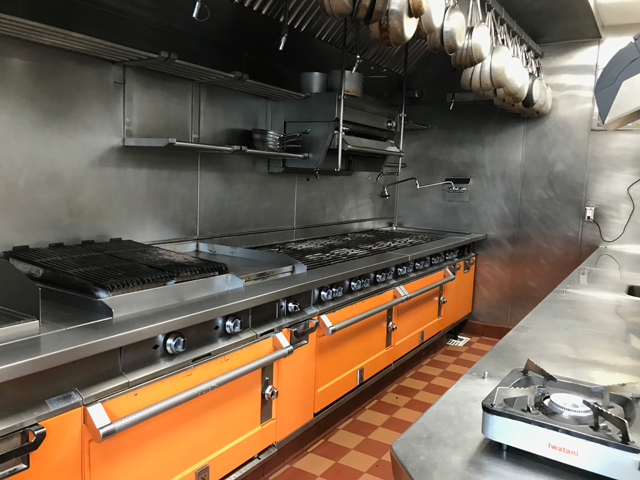 To helm the kitchen, they hired Chef Dave Rochon – all three had worked together at the Milwaukee Yacht Club – and Chef Gary Mann, who was working simultaneously at Fleur de Lis in Cudahy Tower (now occupied by Bartolotta's Bacchus). "(Harwood's) tried to do some more upscale steaks, and seafood and chops but I think the place wasn't laid out well. It wasn't decorated well. That front vestibule wasn't there; we built that. Imagine opening the door in the middle of winter and all that cold air coming in. They didn't accommodate for that. ... (It) was probably here for I'm guessing three years." After Harwood's closed in the summer of 1991, the place sat vacant. Until one day, Joe Bartolotta, recently returned from eight years working in the restaurant business out east, walked past. After eight years in New York, working in restaurants and food & beverage at hotels, Joe Bartolotta decided to return to Milwaukee with his wife, where he used his connections to get a job in the hotel restaurant business. "I came home. I said to my wife Katie, 'We're moving back to Milwaukee,' and she was so happy. I went to work at the Anchorage," he recalls, adding that he stayed there about three years. But how did that lead to an Italian restaurant in Tosa Village? "This was very serendipitous," says Bartolotta. "It just happened completely by accident. I wasn't even looking. I was at the Anchorage as a food and beverage director and running the hotel there. I met a lot of good people, started a family here, I was settling here, and one day, I'm just walking in the Village and on this big window here said, 'Restaurant space for rent.' So I immediately wrote down the number." Bartolotta called building owner Joe Camp, who was skeptical, but agreed to give the budding entrepreneur a shot. Joe called his brother Paul up from Chicago, where he was cooking at the acclaimed Spiaggia after having spent some years cooking in Italy, and the two got to work on the space, the menu and the staff. "I definitely would not have done this without Paul in my corner," says his brother. "I never expected Paul to be here full-time and he never has been here full-time but he's always been here emotionally and intellectually and from a co owner's standpoint, always been a big part of what we do. "So I called him. I said, 'Listen, I want to do a restaurant in Milwaukee.' He said 'great,' he came up, we walked through the space. We hired a designer out of Chicago, who saw the space and just absolutely fell in love with it. He said, 'It's small. It's cozy. There's just so much we can do here.'" Incidentally, Paul Bartolotta got his start in working at two Wauwatosa restaurants: The Chancery and at Balistreri's on 68th Street. When it came time to open Ristorante, The Chancery's owner Joe DeRosa stepped up as a key early investor, says Joe Bartolotta. 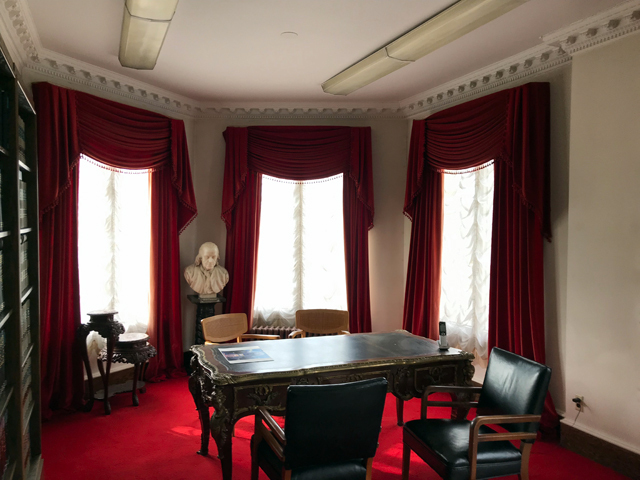 They added the vestibule to combat the Wisconsin winter, they added wainscoting, put in a new floor, new banquettes, removed old carpeting, replaced the bathrooms, added a waitstation, reconfigured some of the back of house facilities and more. They hired Chef Marc Bianchini to run the kitchen. "Paul was still at Spiaggia," Joe Bartolotta recalls, "so he couldn't be up here. He took two weeks of vacation, God bless him, to come up here and help us open the restaurant. He found us a chef – Marc Bianchini. He knew him from Spiaggia. He actually sent Marc to Italy to work at San Domenico. Paul reached out to him and Marc was between gigs, and he said he'd come up here for a while as our chef." And on March 22, 1993, Ristorante Bartolotta opened and was an immediate hit. The Journal's respected – and now departed – restaurant critic Dennis Getto reviewed it five months later and gave it his top rating – four out of four stars. It's the same rating, incidentally, that Getto had bestowed upon Harwood's shortly after it had opened. 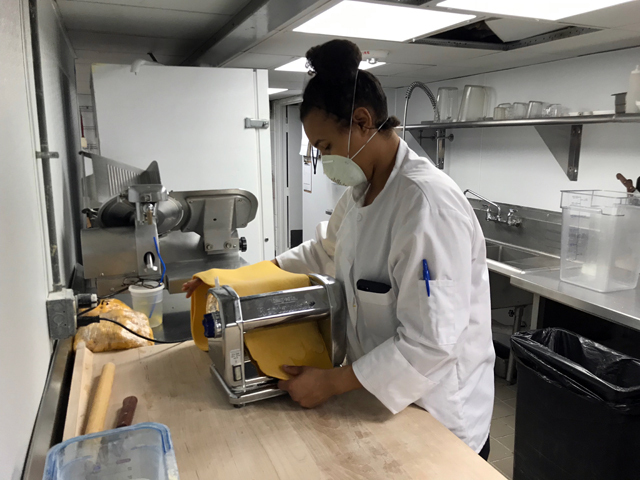 On a recent visit, Joe Bartolotta showed me the sparkling new kitchen, the basement prep area where an employee was making pasta for that evening's dinner service, and the wine cellar, with its vintage gems. We also got a look at the offices upstairs (below) but, alas, could not access the third-story space in the tower (someday!). A second-floor office (above) and its view (below). 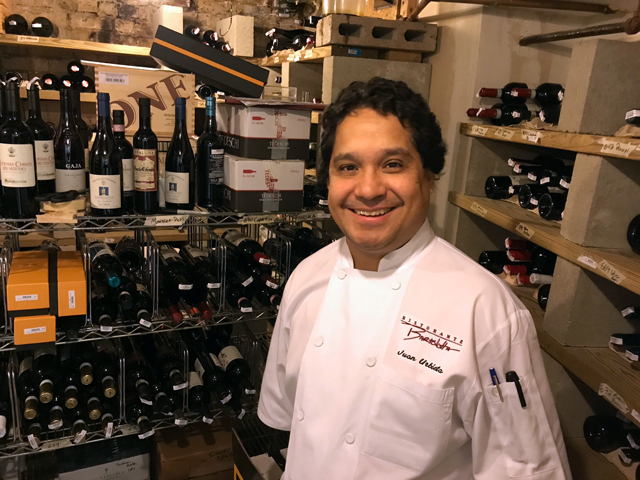 More than two decades later, Ristorante is still the most respected Italian restaurant in the area, consistently topping dining polls and drawing world-renowned Italian winemakers and others for incredible dinners created by Chef Juan Urbieta, pictured below in the restaurant's wine cellar. Also, nowadays, it's almost impossible to keep track of the plates that The Bartolotta Restaurants now has spinning in this town, from Bacchus to Mr. B's Steakhouse to Lake Park Bistro to Harbor House to Joey Gerard's to Northpoint Custard to Pizzeria Piccola to Downtown Kitchen to Rumpus Room to catering businesses at the Grain Exchange and the Italian Community Center, to restaurants it helped open at Mitchell Airport and the Mayfair Collection and on and on and on. Surely, I've forgotten at least a couple. And none of it would have existed if Joe Bartolotta hadn't happened to notice the sign hanging in the window of the building Pabst built in 1899 for saloonkeeper Charles Jacobus on the site of the burned-out Dearsley Tavern that once quenched the thirst of Hart's Mills.